Quite excitingly, on the plane from Singapore to London, one of the available meal options was designed by none other than scary super chef, Gordon Ramsay! It was salmon with pancetta peppers, boiled potatoes and herb butter. It was quite good, as far as plane food goes. 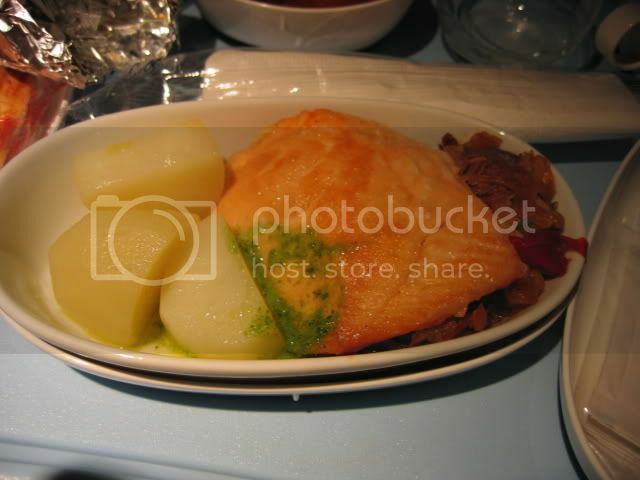 The sturdy texture and strident flavour of the salmon is perfect for in-flight food, which has to withstand long storage, and quick reheating. So now I can say that I did sample Gordon Ramsay's food on my trip to Europe. And it was included in the price of the ticket. Woo. gald u enjoyed ur time in Sg. Dont thnk I will enjoy airplane meal..